Timothy Hay Pellets for Rabbits: FRESH for Rabbits Over 7 Months Old. Timothy Hay Pellets for Rabbits. Best Rabbit Pellets. Did you know pellets are an essential part of house rabbits’ diet? Want to know what type of pellets is best for young and adult rabbits? I have two house rabbits for over five years now, and from my observation, I have written about the best timothy hay pellets for rabbits in this article. I assume you have pet rabbits in your house and you are looking for the best rabbit food, hence you have landed in this article. Here you can only learn about how much timothy hay pellets you must feed your rabbits and the benefits of pellets. My rabbit is my best friend, my family, my everything. Don’t you think If you are willing to become your rabbit’s best friend, then you have to feed your rabbit’s a healthier diet to keep them nourished? To understand how essential is rabbit pellets let’s start by talking a little about a rabbit’s diet. This article is only on pellets for adult rabbits. In the next post, I will explain about alfalfa pellets for young rabbits. In case you are searching for rabbit pellets for rabbits under 7 months, you may stop reading here. Small Pet Select Timothy Hay Pellets. As well as visit our resources page here to discover more of our recommended products. 1 What do rabbits eat and drink to remain in good health? 2 Whats in Rabbit Pellets that make it wholesome? 3 Best Rabbit Pellets Brand to Keep Your Rabbits Nourished. 4 My TOP 3 Timothy Hay Pellets for Rabbits. 4.1 1. Oxbow Timothy Hay Pellets for Picky Rabbits. 4.2 2. Kaytee Timothy Hay Pellets. 4.3 3. Small Pet Select Timothy Pellets. 5 How much pellet is good for rabbits? What do rabbits eat and drink to remain in good health? Rabbits usually eat a lot. They can continuously eat all day. But some rabbits don’t eat everything. They have a color preference as well. Didn’t you realize why your rabbits leave some nuggets all the time when you give them colorful pellets? A rabbit can eat anything doesn’t mean you can feed them as much as they want. Because feeding too much will result in an obese rabbit. An obese rabbit is not a healthy rabbit. To feed your rabbit properly you must understand which nutrients are required in a rabbits diet. If an adult rabbit is fed too much protein based pellets that will result in kidney troubles, however for young rabbits (under 7 months) protein is vital for their growth and calcium for strong bones. On the contrary, if adult rabbits are not fed enough timothy hay based foods or diet with lesser fiber that will cause digestion trouble and may hamper digestive functionality. A rabbit’s diet should mostly be containing fiber and lesser protein. Also, all types of minerals and nutrition must be present for a wholesome rabbit. A rabbit must have a continuous supply of fresh water so that they never go dehydrated. So do you know how old is your rabbit? If you have the answer then giving your rabbit a healthful food menu wouldn’t be a big deal for you. Continue reading this article to find out what proportion of timothy hay pellets for your rabbits is right. Whats in Rabbit Pellets that make it wholesome? Rabbit pellets are nuggets generally made from various kind of foods. A Timothy hay based pellet may contain more timothy hay blend with other nutritional vegetables. For adult rabbits, timothy hay based pellets are best. Because timothy based pellets contain more fiber and less protein, which is not going to hinder rabbits digestion. Timothy hay rabbit pellets will provide your rabbit with the fibers as well as will fill up for the other nutritional deficiency. Best Rabbit Pellets Brand to Keep Your Rabbits Nourished. You must be thinking alright I have learned enough about rabbits diet, where is the list of top rabbits pellets brand? I must say if you love your rabbit it is equally important for you to understand their diet before you choose a rabbit food brand. In real, brands don’t matter if you are going to buy a timothy hay pellets for rabbits. A rabbit doesn’t care what brand of pellets you serve them neither their digestive system. All they care about is being happy and a fresh meal. I say instead of looking on the front side of the pellets packaging, you must check the rear side. Did you ever do that before? Well maybe not. Don’t think I am crazy for I do that every time. Because the ingredient used to make these pellets are going to affect your rabbits’ digestion. 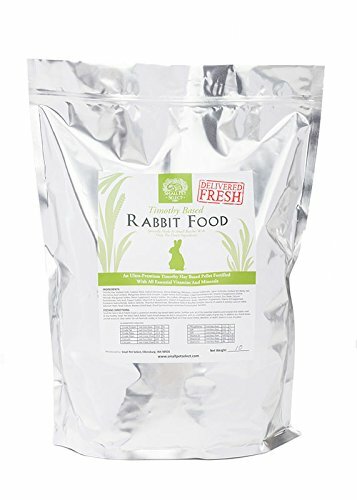 The ingredients will ensure the proper distribution of nutrition and fiber for your rabbits. Best rabbit pellets brand doesn’t matter, all that matters is how the pellets can be beneficial for your pet rabbits. The brand of your pellets must contain green grass as it’s the main ingredient. Because grass is high in fiber. Choose a pellet brand that indicates grass ahead of other ingredients like wheat, oats, corn or maize. Because cereals like wheat, oats, corn or maize are high in protein. Do you want to overfeed your rabbits with protein? Your answer must be “NO” except in case if your rabbits are younger than seven months. Fiber: Not less than 18%. Lesser than that will be harmful to your rabbits regardless of young or adult rabbits. Protein: Protein must be between 12%-14% for adult rabbits. For young rabbits around 16% protein in a rabbit pellet is good. As well as a very good amount of Vitamins, Calcium and Phosphorus must be present in a brand of rabbit pellets. Now, this brings in to my TOP choices of adult rabbit pellets. My TOP 3 Timothy Hay Pellets for Rabbits. 1. Oxbow Timothy Hay Pellets for Picky Rabbits. The Oxbow timothy hay pellets can be found in your nearest store or you can order from Amazon. Why I choose this oxbow as my number one choice for rabbits because it is completely base on Timothy and has a strong aroma of very much like timothy hay. Due to the strong smell most picky rabbits like this oxbow pellets. This timothy hay based oxbow pellet is perfect for any adult rabbits. Do you find your rabbits always have some leftover pellets? Well, then this Oxbow Pellets is what you shall give them. They will love it. Usually, a 5 lbs pack will last for a month for two grown-up rabbits. 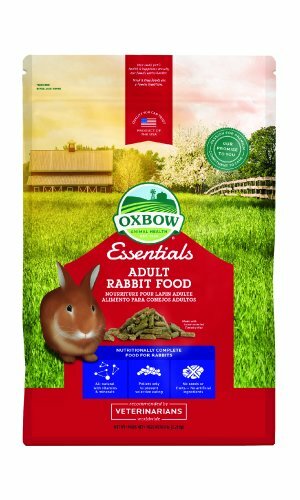 Oxbow pellets are available in larger bags but its best to buy smaller bags so that you can provide your rabbits with fresh timothy pellets every month. To provide your rabbits with sufficient nutrition, these pellets are high in fiber and low in protein so that it is right for your adult rabbits. It comes with a sufficient amount of other minerals and vitamins to keep your rabbits lively with minimum fat. Check the current pricing >>> Oxbow Timothy Based Pellets. 2. Kaytee Timothy Hay Pellets. 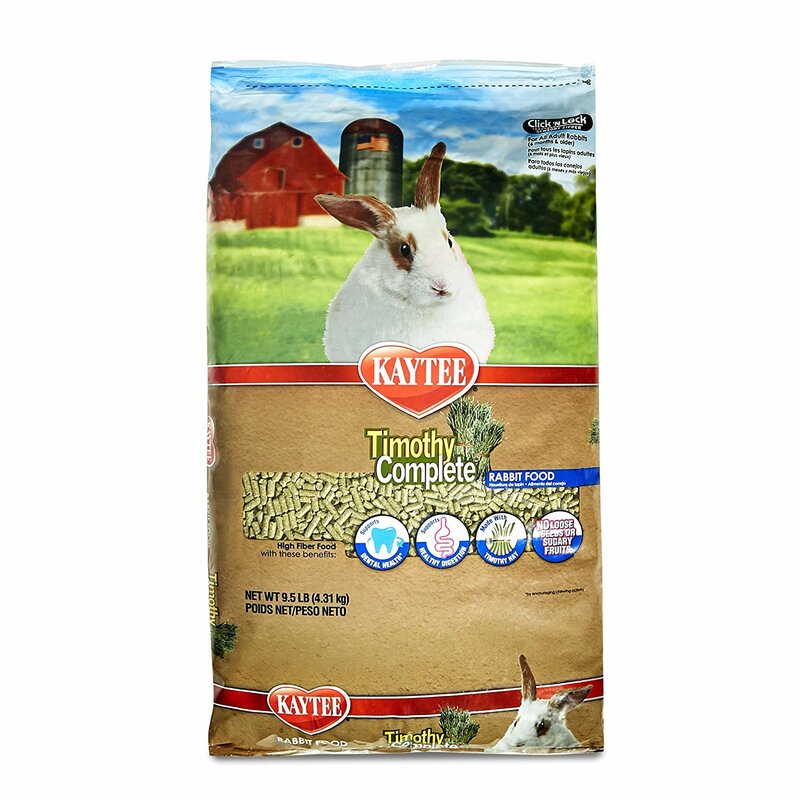 Now, this brings to my second best, Kaytee Timothy based pellets for pet rabbits. This brand of pellet is excellent for your rabbits and is not much different from Oxbow timothy pellets. Prebiotics and probiotics are included in every pack so that your rabbit maintain good digestive health. Prebiotics and Probiotics help with the proper digestion for your adult rabbits. As well as very less sugar and zero presence of seeds and dirt. Hence Kaytee Timothy hay pellets are very fresh. But you must not store Kaytee adult rabbit pellets over six weeks. Do you want to serve your rabbits with unhealthy pellets? I don’t think so. These pellets are high in fiber and come in with all the minerals, and vitamins required for an adult rabbit. Which is just perfect for any adult rabbit but not young rabbits. I don’t like to order one of this over 5lbs because a 5lbs pack lasts easily for a month if you feed two adult rabbits. Always read the instructions in the packaging to find out how much you must feed your rabbits for better health. Don’t overfeed pellets because doing so can increase your rabbit’s weight which is not healthy. Click for the current pricing >>> Kayte Timothy Hay Pellets. 3. Small Pet Select Timothy Pellets. Small pet select creates excellent rabbit foods, there is not a doubt about that. Yet I chose Small pet select timothy hay pellets to be number three. The reason behind that is this pack of pellets can’t easily be found in your nearest pet stores. Small pet select claims that to maintain the freshness and quality of their product they only ship it using Amazon and their online store. These pellets are 100% Made in the USA, and also the price is on the higher end. But there are absolutely no lackings in the quality of your rabbit. Fortified with all the minerals, nutrients, vitamins for a longer and happier life of your rabbits. The high-quality ingredients used to create these pellets will ensure your rabbit’s vitality. The quality of these pellets are visibly better than most other pellets in the market and the fragrance it has tells you about the quality ingredients used to make these pellets. Your rabbits will definitely love this product even if they were picky about their pellets in the past. Serving your rabbits with these pellets will make your rabbits happier. Order yours here >>> Small Pet Select Timothy based Rabbit Pellets. How much pellet is good for rabbits? Understand this, rabbit pellets were made to supply rabbits with the nutrition they are lacking. Due to many reasons rabbit guardian are not able to feed their rabbits with enough green grass. Their only option is grass hay or any other cereal hay. Due to the drying process of hay, the hay loses some of its minerals and nutrients. So to fill up that gap of nutrition you as rabbits guardian have to feed your rabbits pellets. So in this article, as I have only written about food for adult rabbits, now you can choose which timothy hay pellets for rabbits is best. Do not overfeed your rabbits with pellets. It is really not necessary. If it is an emergency and you don’t have access to any other hay or green vegetables you can continue feeding your rabbits with pellets. But from my experience, I have noticed rabbits do not like to continually eat pellets. They like a variation in their food menu. Always feed your rabbits an amount that you think is suitable for their size and mix pellets with timothy hay. Also, do not buy colored pellets. People tend to believe that colored pellets are made from the same colored vegetable. That is not true. Buy the same colored regular pellets as I have explained above, that way your rabbit will also not have leftover pellets. Rabbits often leave pellets as a leftover when they don’t like the color. So to reduce wasting pellets choose the same color pellets and see if your rabbit likes it or not before ordering in bulk. The photos on this page show rabbits in a cage, without any bedding, on bare wire. This is terrible for their feet. Pros and Cons of Pet Rabbits. How to potty train a rabbit fast?